The trust people invest in Government should be honoured by the accountability of officials on all levels and at the same time employees of the state should cultivate unity in their purpose to build a stronger, more vibrant and a prosperous Namibia. 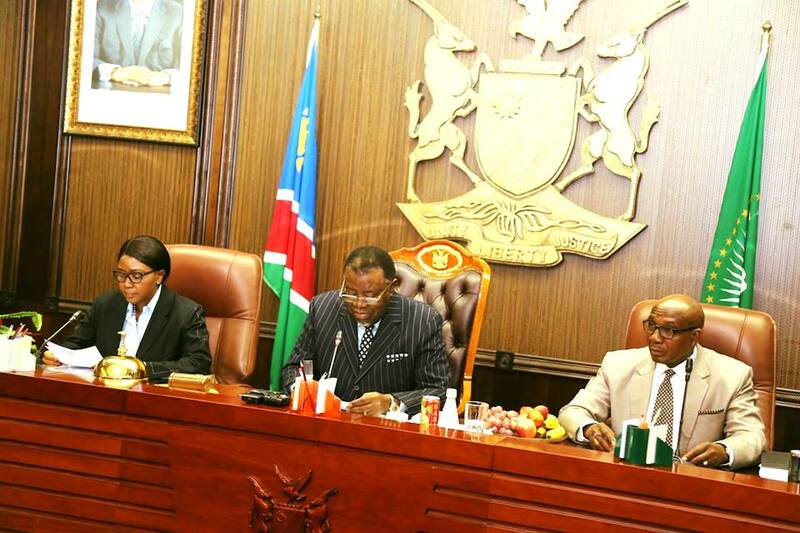 The President of Namibia, Dr Hage Geingob, at the official opening of the first Decision-Making Cabinet Meeting of 2019, urged Cabinet members to remain united in purpose, committed to the common good of the Namibian people and to be dedicated to the building of a prosperous and equitable society. In order to achieve the success, Dr. Geingob urged Cabinet members to inculcate a culture of accountability in their offices and to provide leadership, guidance and support within the framework of the teams serving under them. I am pleased to welcome you to this first decision-making Cabinet Meeting of 2019. I trust that you are well rested and eager to begin what will be a defining year for this Cabinet. It is nearly four years since the electorate gave us the formidable mandate to embark on this critical mission of steering our nation towards an era of sustained growth and prosperity. As this is an election year, we are expected to account to the people, who elected us as their representatives. In 2015, we had the Year of Planning in which I undertook the task of visiting all 14 regions to listen to the needs of the people. In 2016, we had the Year of Implementation where we launched the Harambee Prosperity Plan, a targeted intervention to address the problems that were highlighted during our regional consultations. In 2017 we had the Year of Re-dedication, in 2018 we had the Year of Reckoning and this year, 2019, is the Year of Accountability. As Cabinet, we are called upon to spearhead the business of the State and for this reason we should strictly adhere to the principles of accountability. We are elected to office by the citizens of this country and by being accountable for our actions and our decisions we will be able to measure our on-going effectiveness and ensure we are performing to our full potential, thereby instilling confidence in the citizenry and being responsive to the people of Namibia. Accountability has several functions that assist in improving the performance of our institutions. It is a core ingredient of success and a principle that I expect everyone to adhere to studiously. Michael Ray Hopkin postulates that, “too often leaders of organizations take the credit when things go well, but they find ways to avoid responsibility when they get unexpected results. This behaviour will not work in the long-term; accountability is too important for leaders avoid. They need to make every decision with the resolution that no matter what the outcome, they will take responsibility for the results”. As we prepare to begin our work as Cabinet in earnest, let us reflect on this postulation. As leaders, let us not only take credit when things go well, but also assume responsibility for unexpected results. Let us be accountable and resolute in our decisions and actions. We should not be deterred by the fear of failure but be spurred on by our conviction and belief in working for the betterment of the lives of our citizens. By now, you are all aware of my formula of Accountability + Transparency = Trust. As Cabinet Ministers, by being accountable and transparent, you make a clear statement that, not only are you willing to make commitments, but you are prepared to take responsibility for your actions. By doing so, you will promote trust amongst the people in your ministry, the government and the wider public at large. By assuming the responsibility of representing the electorate, you have entered into a contract, entrusted to protect the interest of the people. You have to be accountable to this trust, knowing that if you break this trust, you are willing and ready to rectify it. These principles do not only apply to the President, Vice President, Prime Minister and Cabinet Ministers, but should be cascaded down within ministries, offices, agencies and at all levels of our Government – Central, Regional and Local. Governors, Mayors and Town Councils should be accountable to the people in their regions, cities, towns and villages. At this juncture, I wish to state that as a means to ensure that Namibia becomes a nation defined by sustainable and shared prosperity, we have identified Economic Advancement as one of the pillars of our Harambee Prosperity Plan. It is through economic advancement that we will be able to create the jobs and income necessary to foster a vibrant and diverse economy. However, economic advancement cannot take place in the absence of trust between Cabinet and the business community. I am disappointed to note that on many occasions Cabinet Ministers do not avail themselves to meet with local and international investors and are sometimes evasive, leaving many entrepreneurs stranded and unable to effectively pursue their business ideas. Sometimes it is best not to make a commitment but once you have done so, you need to be accountable to fulfilling your end of the bargain. By not availing yourself to assist and support investors, you are breaking the important bond of trust that should be fostered between the Public and Private Sector and thereby jeopardizing efforts aimed at boosting our economic growth and competitiveness. Equally, I hear quite often that the press don’t get information from ministers. If this is the case, let us change the culture and be more accountable and transparent when it comes to the provision of information. You must take full cognizance of the fact that your behaviour and actions have an impact on the Government and its perception at home and abroad. In other words, each one of us must have clearly defined roles to play in the execution of our national mandate. This is not the time for personality cults, egos or silo mentalities. I urge you to inculcate a culture of accountability in your offices. By doing so, you will increase performance and output. However, accountability should not be mistaken for controlling behaviour. You are there to provide leadership, guidance and support within the framework of a team. I am glad to note that following my announcement in 2015 that the title of Permanent Secretary should be discarded and be replaced by that of Executive Director, this change will now be effected across government. This should not be a mere name change but I expect that our Executive Directors should become more accountable and transparent in order to win the trust of the public. Over the next two weeks, I will be officiating at the opening of the 2019 Legal Year as well as the opening of Parliament, which will mark the beginning of the Legislative year. My call for increased accountability applies to all three Organs of State. Although the separation of powers is sacrosanct, this does not mean that the Executive does not have the right to demand that all three branches of Government are held accountable. Here, I would like to relate what transpired at last week’s meetings held with City of Windhoek management, the Governor and regional councillors. As you are aware, the issue of the informal settlements was identified as a humanitarian crisis at the Second Land Conference. For this reason I called the meetings, the first which was on Monday with the City of Windhoek Management. At the meeting, the Chief Executive of the City was present and given the fact that he seems to alternate between suspensions and reinstatements, I jokingly commented that I was surprised to see him present. However, the entire process is no laughing matter since while we are faced with serious matters we have to witness the constant suspension and reinstatement of the Chief Executive Officer, coupled with the suspension, with full pay, of the City Police Chief while citizens live in fear of crime, such as shootings in the City Centre during broad daylight. 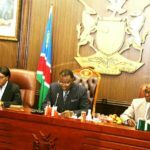 Given this adverse situation, I called a second meeting on Tuesday, this time with the Governor of Khomas, the Mayor of Windhoek as well as regional councillors. There are two doctrines at play in this situation, one doctrine is separation of powers and the other is division of labour. We are all aware of the three Organs of State i.e Legislature, Judiciary and Executive. The Legislature passes laws; the Judiciary interprets these laws while the Executive executes them. As I have stated, the separation of powers is sacrosanct. However, when we talk of the division of labour, we have the Central Government, headed by the President; the Regional Government headed by the Governor and the Local Government, headed by the Mayor. The Governor is appointed by the President and the Mayor is elected, representing the majority party. My directives during the meeting were in line with instructing representatives of the majority party but at no point did I declare that in my capacity as President, I am going to reinstate the Chief Executive Officer or the City Police Chief. I merely alluded to the fact that we cannot be held hostage by the fiasco at the City of Windhoek while people continue to suffer. This year, we will be marking 29 years as an independent nation. Our challenge is to ensure that the peace, unity and stability we have enjoyed over these years is translated into tangible results for the people. Our challenge is to take our country to the next level of success. By being accountable we can build a stronger Namibia, a more vibrant Namibia and more prosperous Namibia. Let us remain united in purpose, committed to the common good of our people and dedicated to the building of a prosperous and equitable society. With these words, I wish you all a productive and successful 2019. God bless the Republic of Namibia.